We specialize in aluminum and copper gutters that we extrude directly on the job site to ensure a perfect installation. In fact, most of our gutter installations blend in to the existing architecture so well that you can hardly tell the house has rain gutters. 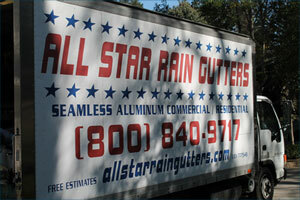 Southern California Home Builders choose All Star Rain Gutters as their preferred installation company. We pride ourselves in being professional and courteous. We treat all of our customers with respect and make sure that we are prompt and efficient in our job estimations. At All Star, we ensure hassle-free gutter installations. Whether we're installing a custom configuration or a basic gutter solution, all of our installers conduct themselves with the same family basis our company is built upon; Honesty - Courtesy - Dependability.